Every year millions of people buy raised toilet seats for a friend, loved one, family member, or for themselves. Most do not know that these products become contaminated with feces and need to be hand cleaned on a daily basis to stop the spread of pathogens. Additionally, the cheap raised toilet seat models can become dislodged from the toilet bowl when in use and cause a fall or worse. Don't take chances and save yourself the embarrassment and hassle of a raised toilet seat. Medway sells the most premium toilet riser on the market. Instead of the cheap foreign made raised seat toilet risers that are dirty, clunky, unsanitary, unsafe, and embarrassing, we raise the toilet from the base and eliminate all the problems associated with raised seats. Our bases can support an industry leading 800 lbs and are made of industrial PVC that will never rot, mold, or mildew. 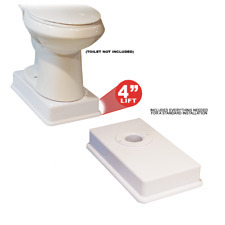 Medway toilet risers have no moving parts, an integrated waste pipe, and will last a lifetime!